Leather and vinyl couches, chairs and pillows take a beating in a typical home environment where they interact consistently with pets, children, snacks and life-in-general. It's important to clean these family troopers on a regular basis to ensure they continue to perform with both fashion and function. 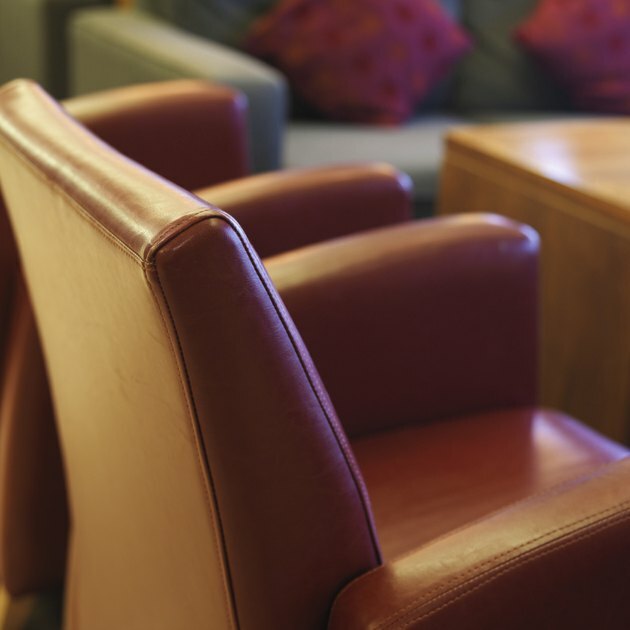 Choosing the right products and procedures simplifies the cleaning of both leather and vinyl furniture in your home. Leather furniture last for years with proper care. Prepare the leather or vinyl furniture for cleaning by vacuuming thoroughly to remove loose dust, lint or other particles. Continue with a light, wet cleaning before using a leather/vinyl cleaning product. Mix a gentle, non-detergent soap with water in a small bowl or bucket. Choose a hand soap that is free from dyes and fragrances. Use three or four drops of soap per quart of water; gradually add more if necessary to make the solution bubble. Use a damp cloth or soft-bristled brush to apply the cleaning solution to your furniture. Apply the bubbles rather than the liquid. Rub the brush lightly up and down the dirty sections of the sofa or chair. Rinse off the soap with a sponge or clean rag dampened with water. Use a soft, thick, non-abrasive sponge or a cotton rag without course fibers. Switch to distilled water to remove any obvious stains or spots. Mix a solution of equals parts distilled water and mild soap, then blot with a clean, soft cloth. Rinse with distilled water. Remove excess water from the leather or vinyl by blotting with a dry cotton cloth. Do not allow any water to remain on the furniture as it could create a stain. Continue cleaning with a standard vinyl/leather cleaning solution. Leather and some types of vinyl are absorbent and may hold stubborn stains that are difficult to remove with soap and water alone. Follow the mixing and application directions supplied by the manufacturer. Apply the solution with a soft cloth or paper towels.